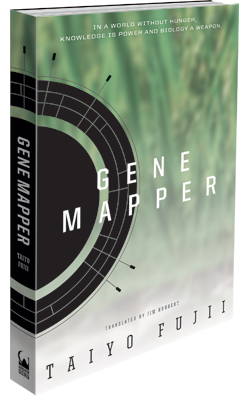 ﻿ Gene Mapper « Haikasoru: Space Opera. Dark Fantasy. Hard Science. Sascha Leifens was subtitled across her chest. So this was the reporter my waitress liked so much. Sascha shrugged her shoulders and tossed her bobbed red hair as she stepped down. I knew she was an avatar when her hair returned to exactly the same position. Most casters use RealVu to at least give the impression that they’re communicating facts. Not Sascha. A large chart appeared above her head with a string of thirty or so ones and zeros along the top. Below the ones and zeros was a date readout: years, months, days, hours, minutes, seconds. The time count on the chart rolled toward the overflow point. Now almost all the numbers were ones. Sascha made a pistol with her thumb and index finger and took aim at the chart.